The world is changing – but whose voice is telling you how? Global Research brings independent, real information from investigative reporters, academics, witnesses and anti-war activists. We provide a platform for global news and analysis, free from hidden agendas, corporate interests and government interference. The Mainstream media turns realities upside down. War is presented as a humanitarian endeavor, sweeping austerity measures are portrayed as a precondition for reducing social inequalities, killing civilians are said to be part of a counter-terrorism operation. The Lie has become the Truth. MSM pundits are generously rewarded for spinning the news. In contrast, Global Research operates with limited resources. 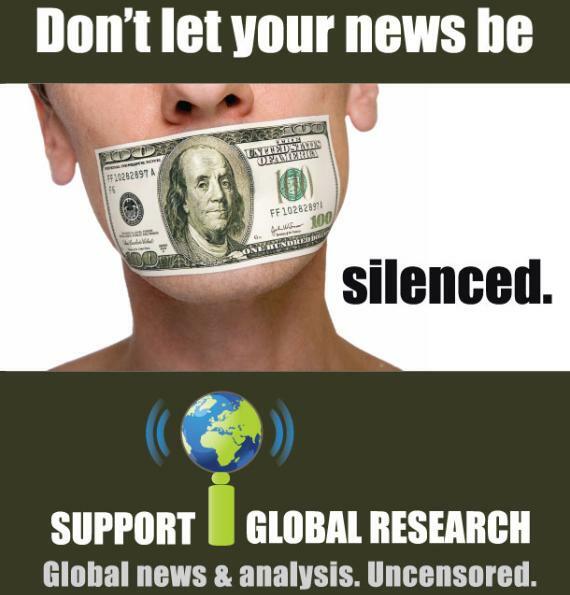 You can help protect independent news by supporting Global Research with a donation. Please give what you can: every donation, from every reader, helps empower us all. Global Research stands at a pivotal moment in its 17-year history. Increasingly we are faced with new challenges regarding how to keep our content flowing and accessible to all. The more people we reach, the better our chances to contain media manipulation. You can help us increase our reach by making a donation or sharing our articles online. Together, let us attempt to reverse the tide of war and social injustice. Be a part of it and contribute to the future of Global Research.